The Ten Commandments are the Laws of God’s covenant given to Moses on Mount Sinai. These Laws were followed by the Israelites and are God’s Laws for us, today, as well. The Ten Commandments show us as Catholics how to live a life of love. The first three commandments help us to show love and respect for God; the other seven to show love and respect for others and for ourselves. 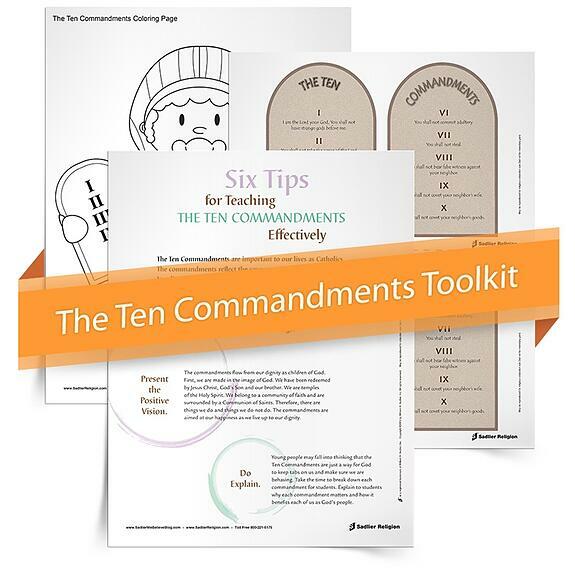 Below is a free teaching toolkit with printable ten commandment activities for kids. These resources will help you easily and effectively teaching the Ten Commandments to youth at every stage of their religious formation. Use the second resource – a Ten Commandments coloring page – with preschool or primary aged children. This resource can accompany the story of Moses receiving the Ten Commandments from God. Share the story from a children’s Bible before you distribute the coloring page. Children can take home their completed page to share with family members. Challenge children to recount the Bible story to family members at home as well! Use the third resource - Six Tips for Teaching The Ten Commandments Effectively eBook – to find inspiration when teaching the Ten Commandments to youth. The eBook will help catechists teach about the covenant and the Commandments without it seeming like just another list of do’s and don’ts. Written from the experience and perspective of a middle school catechist, this eBook suggests things to do and to avoid doing while teaching the Ten Commandments to students. Download the Teaching the Ten Commandments to Youth Toolkit now! With these ten commandment activities for kids, you will encourage students to live a life of love and follow God's Laws.